Once you take a sip of “Mitsuya Saida” (三ツ矢サイダー) you will most surely love it. This drink, called “Mitsuya Cider”, is produced by a Japanese company called Asahi Soft Drinks. It’s not your typical cider as you would have it in the west - this famous carbonated drink would be best described as a cross between Ginger Ale and Sprite. Today, it holds the position as one of Japan’s top ten drinks. This refreshing, popular soft drink was first produced way back in 1884. It used to be distributed and sold in metal bottles that had decorations on them but is now produced in cans or plastic bottles – and it also comes in a whole variety of flavors, such as Mikan (A citrus fruit), lemon, white peach, melon, and grape. For those who like a bit of nostalgia, the metal bottles are still available in vending machines and in some stores for any customer who wants to reminisce the good old days, when Mitsuya Cider still looked like it used to. Does Mitsuya Cider Have Any Alcohol? Cider, as it is usually understood, is made from the juice of apples, left to ferment, and form an alcoholic beverage. The traditional English ciders do contain alcohol. This is not to be confused with Mitsuya Cider, although its name has the word “cider” – for it is not an alcoholic drink. This non-alcoholic refreshment is just plain soda that quenches your thirst on any hot summer night or day. This prime, bubbly drink has carbonated water which is what makes it fizzy. It also has high fructose corn syrup, citric acid, artificial flavor, vitamin c, carotene color, paprika color, acesulfame-k, stevia, and orange juice. The ingredients depend on which flavor you’re drinking. As for more information on the breakdown of those ingredients - high fructose corn syrup is now considered be an unhealthy component to consume as it can increase the amount of bad cholesterol one has, as well as possibly contribute to/cause diabetes, cancer, and disorders of the liver among others. It is now recommended that this ingredient is used sparingly. Artificial flavoring is usually derived from chemicals made in a laboratory and offers no nutritional value and may have harmful effects on one’s health. As a review of its overall nutrition content, Mitsuya Cider is basically an energy drink with its high sodium and sugar content having 42Kcal per 100g. While this drink may not be exactly the healthiest beverage to consume every day in place of water, it’s fine when taken in moderation. Caffeine in Mitsuya Cider isn’t a problem. It may have a very minimal amount, but not enough to get you buzzed. Drinking a cup of the soft drink will load on 99 calories. It has 0 grams of fat, 19 mg of sodium, and 26 grams of total carbohydrates. All those carbs break down to form 26 more grams of sugar. So, if you get an energy buzz from drinking some Mitsuya Cider, better not to blame the caffeine, and instead blame the sugar. Luckily, Asahi has made a variant of Mitsuya Cider that has no sugar for your enjoyment. Asahi Mitsuya Zero Strong is for those who love Mitsuya Cider but don’t like the extra calories and sugar that come with it is. The item comes in 3 sizes; 250 ml (8.5 oz), 500 ml, (16.9 oz) and 1.5L (50.7 oz). 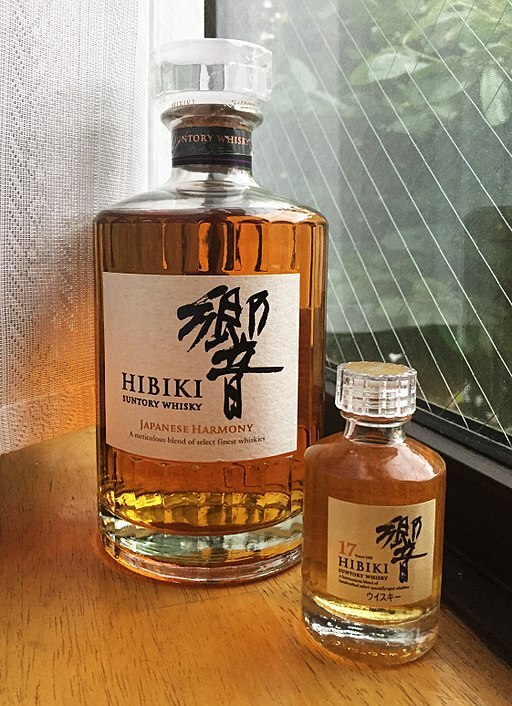 A 250 ml bottle could set you back around 80+ yen. This is a wonderful alternative for those who want to cut back on the unhealthy habit of sweets. Where Can You Find Mitsuya Cider in Australia? It may be hard to find exactly Mitsuya Cider in Australia, as it is specific to catering to the Japanese region only. However, it’s good to note that Asahi Beverages, the same company that products Mitsuya Cider, also sells cider products around Australia that you may be familiar with. 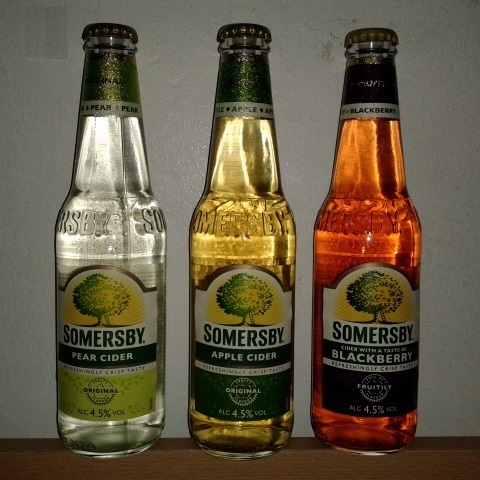 These products include Somersby cider, which is Australia’s top-notch cider brand that comes in Blackberry, Apple, and Pear flavors, Wild Side Cider around New Zealand, and Honesty Box Cider, which is authentic apple cider brewed from apples of different types picked around New Zealand. Honesty Box Cider has 3 flavors; NZ Rose, Granny Smith, and Braeburn. If you’re insistent on having Mitsuya Cider in particular, you may try your luck in a specialty Japanese convenience store. If not, ordering online may work, - and it’s easier too, just find a trustworthy shop and add the item to your cart. Watch out, though, shipping fees may end up even more expensive than the cider itself. Mitsuya Cider doesn’t just come in liquid form; it comes also in very interesting small hard candies that when chewed and mixed around in your mouth, they dissolve and make sizzling and popping sounds that can offer an interesting and tasty sensation on your tongue. The candies are manufactured by heating its mixed ingredients until they finally all melt. They are then exposed to pressurized carbon dioxide gas. They are then packed in a bag. Tiny high-pressure bubbles then get trapped within the candy which gets released when eaten emitting a tingling, flavorful sensation in the mouth. If you really don’t believe these bubbles exist, you can take a microscope and see for yourself. Mitsuya Cider candy contains soy, sugar, syrup, vegetable oil, baking soda, perfume, anthocyanin pigments, strawberry juice concentrate, acidulant, peach juice concentrate, and grape juice concentrate. One serving of Mitsuya Cider Hard Candy has 16 calories only. It contains zero grams of Total Fat, Saturated Fat, Polyunsaturated Fat, Monounsaturated Fat and Trans Fat. It contains zero grams of Protein, Salt, Dietary Fiber, Potassium, and Cholesterol. It has 21 mg of sodium and 2 grams of sugar. Total Carbs are 4 grams. It also does not contain any Vitamin A, Calcium, or Iron. Is Mitsuya Cider Candy Halal? Before answering that question, it must first be cleared what “Halal” means. Halal is the Arabic word for indicating if a thing such as a food is allowed to be consumed or if an action is permitted according to the Muslim scripture which is the Qur’an. Under Islamic law, there are certain products that are classified either as Halal or Haram. Haram indicates the opposite of Halal, and it simply means it is not allowed under Islamic Law. All desserts and sweets are made without alcohol, animal lard, animal shortening, gelatin and artificial vanilla extract may be considered Halal – therefore, because Mitsuya Cider candy is made purely of sugar and fruit juice, they are all accepted as halal. Mitsuya Cider remains a staple fizzy drink in many Japanese households. While it’s loved around the country – is it a hit with foreigners? After reading feedback on it, here are some findings. Firstly, it’s quite easy to find, as it is available in almost any “kombini” or convenience store, or supermarket. A size that is decent to quench one’s thirst on a hot day is 500ml, which contains 175.5 kg energy, 11 grams of carbs, 0 grams fat, and 8 mg of sodium. Expect it to fizz a little as you open it; you will feel some of that carbonation on your tongue on the first drink. Its taste is very cool and light, and more citrusy than it is apple-flavored. Sometimes, this drink is compared to America’s lemonade, but not as tangy, and fizzier. Nevertheless, you may feel a little bit thirsty after drinking a whole bottle of this, so best have some water on the side. In the end, the reviewer did not particularly fall in love with the drink but found that her partner – who grew up in Japan – would do anything for a bottle of Mitsuya Cider. If you look closely at the Mitsuya Cider icon, you’ll see 3 decorated lines joining each other in the center to form 3 145-degree angles. Examining the logo further, you’ll find out that these are 3 arrows (with the red rectangles being feathers). These 3 arrows are represented by the word “Mitsuya” – as “Mitsu” is Japanese for “3 of a certain thing”, while “ya” means arrows”. 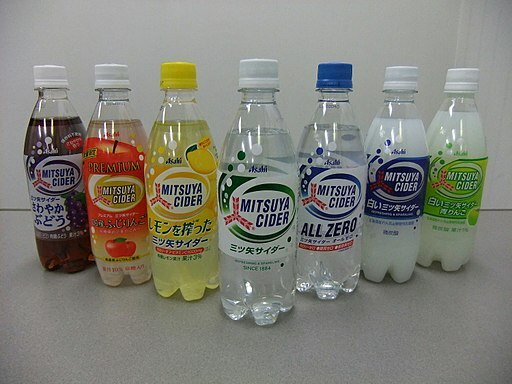 As for the other fun fact – did you know that Mitsuya Cider was not too well known in the west until only a decade ago? Back in the 80’s, the face used in advertisements of Mitsuya Cider was Rick Astley, the famed star, and singer of “Never Gonna Give You Up”. Advertised as “clear and natural”, Astley can be seen sipping Mitsuya cider while he sings “Take Into Your Heart”, accompanied by blonde backup dancers. It was in 2008 when “rickrolling” became a huge internet sensation. Both a prank and internet meme, this involved the sudden appearance of Rick Astley singing “Never Gonna Give You Up”, interrupting a video you were watching. It was through Astley’s sudden surge of fame that the west rediscovered Mitsuya Cider and took a liking to it. To many who have grown up in Japan, Mitsuya Cider is a favorite drink. As for experimenting with other drinks around Japan, it doesn’t have to end there. For those who prefer non-alcoholic drinks, you can stick to tasting Japan’s authentic teas; particularly green tea in both matcha form and loose-leaf form, along with all its variants, such as a Matcha Latte, steamed green tea or “Ryokucha”, or with added roasted brown rice, known as “Genmaicha”. There’s also Sakura tea; edible cherry blossoms steeped in warm water. There are so many different variants of soy milk in Japan, you can try anything from melon to black sesame with honey. Yakult is also hit, albeit not dairy-free like soy milk, but it has probiotics in it, which is good for your gut. Canned coffee is also a favorite, especially from brands Georgia and BOSS. If you prefer sticking to soft drinks, melon soda is a huge hit all around Japan and is loved for its cool and sweet cantaloupe flavor, as well as its bright neon green hue. Various sodas from Sangaria are also good to try out. Prefer alcohol instead? Sake, which is made from rice, is a must-try, alongside Shochu (can be distilled from either buckwheat, brown sugar, sweet potatoes, rice, or barley) Low Malt Beer (also known as “Happoshu”), peach liquor or “Momoshu”, plum wine or “Umeshu”, citrus liquor or “Yuzushu”, and most especially Japanese whisky. If you happen to be in Japan and you want to beat that thirst with a sparkling, cold and refreshing drink, then grab yourself any of the unique flavors of Mitsuya Cider readily available in convenience stores or supermarkets throughout Japan. That mixture of sweet, tangy, fruity, bubbly, soda drink will hit that spot, and remind you of being on a tropical island. Enjoy it as an ice cream float too. It will go perfectly well poured over a scoop of vanilla ice cream.